A Ca2+-sensitizing protein factor first isolated from minced muscle showed some similarity to the previously found tropomyosin in amino acid composition and was thus considered to be a native form of tropomyosin (Bailey, 1946; 1948; Ebashi, 1963; Ebashi and Ebashi, 1964). In 1965, however, a new protein was found in this protein factor in addition to tropomyosin and named troponin (Ebashi and Kodama, 1965). The discovery of troponin triggered a new era of the molecular biology of the regulation of muscle contraction. Troponin was shown to be the Ca2+-receptive protein for the Ca2+-sensitive contraction in striated muscle. In the absence of Ca2+, troponin in association with tropomyosin suppresses the contractile interaction between myosin and actin, and this suppression is removed by an action of Ca2+ on troponin to activate the contraction (Ebashi et al., 1968). An electron microscopic study revealed that troponin is distributed along the thin filament at regular intervals of about 40 nm, and this finding led to the construction of a model of thin filament as an ordered assembly of troponin, tropomyosin and actin (Ohtsuki et al., 1967; Ebashi et al., 1969). 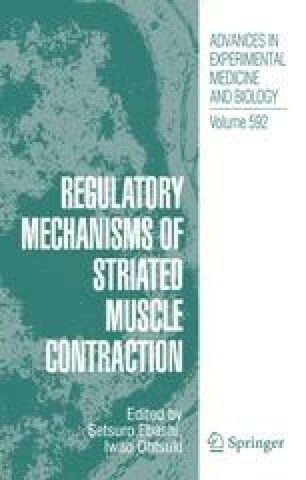 By these studies, the molecular basis of the Ca2+ -regulation of muscle contraction was established.